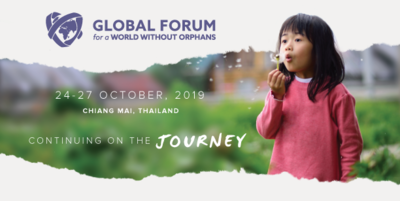 We are glad to announce the 2nd Global Forum for a World Without Orphans, October 24-27, 2019, in Chiang Mai, Thailand. It will have been over three years since we had our first global gathering and almost 10 years since the global movement began. God is doing amazing things to change the world for many orphaned and vulnerable children and families… and He has done much in our lives, as well. As a movement we have a clear vision: that every child would grow up in a safe, stable, and nurturing permanent family and know their heavenly father. And we believe we are called to achieve that vision by helping children remain in, be reunited with, or regain a healthy family so that they can reach their God-given purpose. At this forum we want to focus on HOW we can best get that done. Achieving our dreams for children to be in permanent, loving families will not happen quickly. We are on a long journey to a new place for children and families. How do we have the strength and wisdom to continue such a difficult journey? How do we make this a sustainable movement and not a temporary trend? At this forum we want to focus on three things that can give us strength for the journey: ACTIVATE spiritual care of ourselves, others and our work, CONNECT to and support one another relationally, spiritually and practically, and EQUIP ourselves and each other to do the best work possible by relying on God’s wisdom as revealed through science, others, and His holy Word and Holy Spirit. We highly value all who contribute to the WWO movement and hope you will consider being a part of the journey. More information regarding the location, program, and application to attend will be available soon. Please save the date! October 24-27, 2019, Chiang Mai, Thailand. This is an invitation only event with initial invitations going out in April. Everyone is invited to fill out this application to be considered for attendance. Thanks for all you do for vulnerable children!